Happy New Year to all TGS readers from Me and My Daughters (Diya and Neha). We wish you and your family a happy and prosperous New Year. As you already know, at TGS, with your tremendous love and support, we are committed in publishing high quality articles on Linux and open source technologies. This year, we’ll be increasing the article publishing frequency, and you’ll see lot more detailed tutorials from TGS. Our goal is to educate you on Linux and open source technologies on an on-going basis. From my heart, I appreciate all the support given by the regular readers of the blog. I’m very grateful to have you as part of TGS blog. Leave a comment with your New Year wishes. 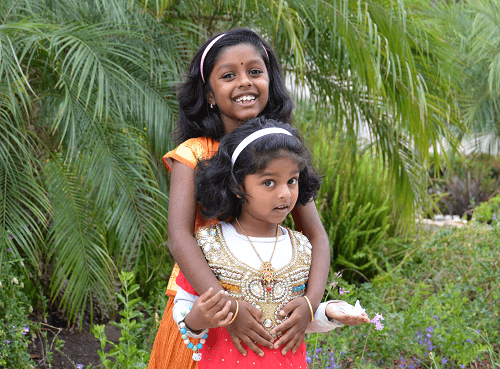 Happy new year, RAMESH NATARAJAN, and Diya and Neha! Your teaching is much appreciated ! Thanks for all the effort & Happy New Year. Happy New Year to you also! Your daughters are beautiful girls. I always appreciate the thoroughness of your articles. They usually stand out from other resources available online. I have been learning Docker recently and was experiencing difficulty using it on Windows with Docker Machine and Kitematic. Have you tried it out yet? I would love to hear about your experience and look forward to maybe another great article! May 2016 keep you (and your family) healthy ad bring you all you wish for. Ramesh, happy new year ! You have two beautiful, healthy daughters. Your dedicated work is highly recognized and appreciated. I always recommend your web site to my colleagues. All the best to you and your family in the coming 2016! Happy new year. Ramesh, your daughters are more beautiful than ever ! Ramesh ,Happy New Year, I hope the next year it’s better. I won’t receive your newsletter regulary the past year, I don’t Know, please you can verify this. All the best wishes for you and your family. Keep up the good work, it is much appreciated. Happy New Year and a big kiss in everyone’s heart. Wish you and your family happy and prosperous new year. I appreciate and thanks you for your efforts towards open source education and Linux. Your almost all articles are our time saver. Whenever we stuck up while troubleshooting Linux in our day to day life, the first thing we google is (thegeekstuff+linux query) because we are so much habitual of your articles. In this new year, we are expecting a lot from your side and we even know that you will definitely make justice to our expectation. Last but not the least, we all also want to make some contribution to your efforts so that this conversation can be duplex. Wish you and your family happy , prosperous and healthy happy new year !! Happy new year, and God bless. Happy New Year from Hungary 🙂 Boldog új évet! Happy New Year 2016 You and Your Family…. Best wishes for your CUTE daughters……. Namasthe Brother . May God Bless You. Thanks for all your Tutorials. Happy New Year 2016. Thanks for all Your effort & Happy New Year!! All the best to you and your family in 2016. Happy new year from Russia! Happiness and prosperity to you and your loved ones. As the New Year has come to us with hopes anew, here is to wishing TGS, you and your family a wonderful year ahead. Happy New Year! Many good wishes for a successful and happy New Year. I have benefited a great deal from your relevant, concise yet complete tutorials and articles. Keep up the good work, Ramesh. You are a great resource and a tireless contributor to the community. Happy New Year to you and your family. I look forward to reading articles, having my students use your resources and maybe even submitting a “how-to” article myself. May all your dreams come true and more through out the new year. Thank you for this nice work you’ve been doing. Happy New Year and a 2016 very prosperous to you and your family! Great site. Great information! I always look forward to reading your newsletter. Thank you. Keep up the great work. Thank you for all your articles! Thank you. You have beautiful daughters. I just called my wife over to see. What a pleasant way to start the year. Wish you and all you loving family the best for this year. I see Linux has lots of X11 windows Like Gnome and KDE and so on. Non of them mastered the desktop environment so when you log off and shut down computer or restart desktop. So your applications auto start on same windows space 1 to 4 any of that and on their real position and size. (Some they do start but they all start on same 1st windows space.) If you have any info. you may write a article on this subject. I look of this all over and I can’t find an answer. Today Linux is behind because no one has mastered this and it is hard to use day in day out. In this case windows OS is easy to use. Happy new year for you and your beatiful family too! Thanks for the greetings! Happy New Year to U & Family Members. I wish our TGS Network should grow more & more. Thanks for Ur articles on open Source. Happy New Yearto you and your wonderful family and Thanks for your useful articles !!! a wonderful and interresting 2016 to you & family ! Happy New Year to you and your family. Keep up the excellent work with ‘thegeekstuff’. Thank you for the great work you are doing. Happy new year from Canada! Thank you for a very useful website and resource, I greatly appreciate all you write and have used it to learn a lot about Linux over the past years. Thank-you and I wish a very sincere Happy New Year to you and your family. Happy new year for you and your wonderful family. Thanks for your work and very useful articles. A very, very happy new year, to you and your lovely daughters. Happy New Year to you and family. Thank you for your information. ‘Much value your publications. Many thanks for them. Please, add to the present list one on USING Tarsnap. The book “Tarsnap Mastery”, which I’ve bought, is although its author’s (Michael Lucas) writing sometimes gets in the way of what I want to know: how to use Tarsnap! Jokes I don’t need. Clear pointers and command line examples I do. Happy 2016! I wish you and your wonderful family a wonderful Holiday. Ramesh, I wish you a Very Happy new year for you and your Family!!!! Happy new year for you and your wonderful family..Thanks for Ur articles on open Source. Wish you and your family a very Happy New year 2016 ! Wish you and your family a very Happy New Year 2016! Thank you very much! I wish you and your family are happy and successful! Wish and family very happy new year..!! very cute kids, and great stuff on TGS. wish you and your family a happy new year!! !